A Success Story – Frederick Sirody | Service Coordination, Inc.
Mr. Frederick Sirody is a resident of Harford County, Maryland who recently celebrated his 70th birthday. Frederick, known to his friends as Fred, attended the University of Maryland in 1978 and graduated with a bachelor’s degree in criminal justice. Fred held many employment positions throughout his working years and developed an extensive resume. For example, he worked at the National Center of Institutions and Alternatives preparing cases and assisting with alternative options to incarcerations for individuals accused of crimes. Among other job titles, he also spent time as a live-in residential supervisor for the Arc. Fred is a caring person and held volunteer positions with organizations such as Health Care for the Homeless and Jewish Big Brother Big Sister League to name a few. Fred has always been a sports fan and particularly enjoys baseball and lacrosse. He continues to be an avid reader and his favorite hobby is to spend time at the public library. Throughout 2017, while residing in a town home with several roommates, Fred found himself struggling with his health. His physical well-being declined rapidly, and he began to experience pain daily related to his illnesses. Lacking proper support, Fred’s ability to care for himself deteriorated. He was diagnosed with a gastrointestinal infection that required surgery in November of 2017. Following the surgery, Fred was admitted to a rehabilitation facility. After three months, he was discharged, and the transition was difficult as he attempted to continue his recovery process at home. The hospital outreach coordinator from Harford County, Susan Germeroth, stepped in to help. She made a referral for the Community First Choice program, also known as CFC. Fred wanted to remain as independent as possible but agreed additional support could help with his recovery process. Supports Planner Alysia McVey was assigned in March of 2018. Alysia helped Fred to obtain six hours per week of personal care through an agency called Caring Nurses Services. Fred shared with Alysia that he felt his living arrangement no longer suited his changing physical needs. A long staircase led to Fred’s bedroom and this made moving about the home difficult on a daily basis. In addition, Fred had limited access to public transportation from this location. Alysia was able to identify options for Fred to move forward with a new living arrangement. She located a senior living apartment complex called Burton Manor that provided everything Fred needed. As his Supports Planner, Alysia was able to assist and guide Fred to obtain necessary legal documents required to apply. Alysia prepared Fred that there was a waiting list for this location and it could take up to 2 years before he may be called with an opening. Fred understood and was prepared to wait, as this location was a perfect fit. Surprisingly, two weeks later Fred received the call that a unit was available for him and he could move in the following week. Alysia began working immediately to locate resources to assist Fred with his move but was unsuccessful. The short notice and limited funds created a barrier. Alysia was determined to help Fred with a successful transition. She stated, “I decided to take matters into my own hands.” Alysia coordinated with Caring Nurses Services and together they developed a plan. One evening, Alysia, one staff member from Caring Nurses, and two community volunteers arrived at Fred’s old town home. Working together, the small team took six hours to move Fred’s belongings into his new apartment using their personal vehicles. 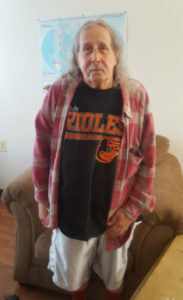 Alysia continued to provide support to Fred until the move was finalized by assisting him to set up utilities and cable. She was able to locate donations of furniture and, once again, delivered the items personally to him.